In this edition we're showcasing 3D models by Apollo Opening Roof System, Ameristar Fence Products, American Cork Products, and AquaMaster Fountains & Aerators. We've also gathered projects from Kenneth Lynch & Sons, PolySoft Surfaces, Continental Building Products, and Indiana Limestone. The Apollo Opening Roof is a unique system that provides protection from the rain, while allowing the flexibility of variable shading and light. By opening the louvers slightly heat escapes, allowing natural ventilation and additional cooling. In the cooler months open the Apollo louvers for direct light to increase solar heat and brighten interior spaces. Ornamental aluminum fencing has been redefined with the introduction of the Echelon II industrial aluminum fence system. This fence is the strongest and most durable aluminum fence available in the industry. Echelon II’s ForeRunner rail design enables this fence to have several attributes uncommon to typical aluminum fences. AmCork's Iris cork floor is a linear running design which colors from light to dark in tone. 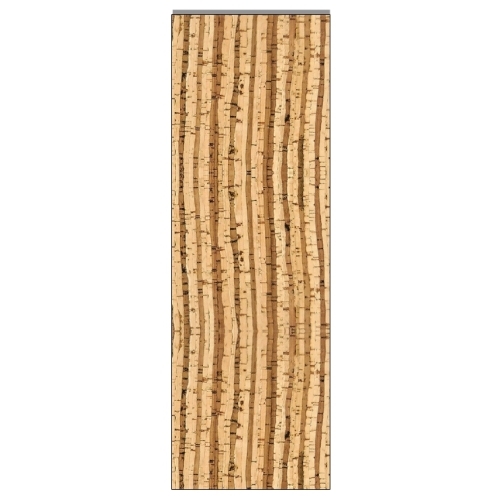 The color tones on this style are produced from the inner layer (light tone) and the outer layer (dark tone) of the cork bark itself. This style lends itself to hiding seam lines within the design. Occasionally we have the opportunity to collaborate on some very intriguing projects. A long time collaborator of ours, Pat McClane, McClane + Smith Architects of Richmond, VA, came to us with an unusual request. His clients are avid supporters of The University of Richmond athletics program and he felt it would be a great nod to that interest to include the school mascot, a spider, on their new dwelling's exterior. We worked with Mr. McClane to design a hand wrought iron spider that had a realistic air to it. The frame was made of lead, the spider was mechanically attached and all parts were then finished with a faux bronze patina. PolySoft enters the resort scene at one of luxury Anantara Group’s latest hotels. Banana Island lies off the coast of Qatar’s capital, Doha, and opened in January 2015. The resort incorporates a wave pool for adults and a children’s play area, both surrounded by PolySoft slip-resistant surfaces. “Extreme weather conditions of high temperatures and high humidity demanded a durable, high-quality product,” says Tamer Mortada, of Play+ Qatar, the company that laid the surfaces, and which recommended the use of PolySoft. Part of luxury is of course ensuring guests’ safety as they enjoy spectacular amenities in a beautiful setting. PolySoft Splash surface, applied here in colours of Blue, Alabaster and Arctic White, sits easily with the sparkling turquoise waters of this coastal idyll. Softer and cooler than other surfaces, it’s comfortable underfoot and protective against falls — no banana skins here! Limestone from the hills of Indiana is a resource of international magnitude, a precious raw material that fires the design imagination and yields landmark structures not to be achieved with anything less. The people of Indiana Limestone Company are an equally amazing and powerful resource, absolutely necessary to realizing the potential of our beautiful stone.Every segment of our workforce contributes to this. ILCO’s management cadre defines the basis of industry leadership, providing a unique source of intellectual and material support. Our sales force is structured for maximum assistance on every project, controlling costs, streamlining processes, and contributing to outstanding results. Our quarrying and finishing teams set standards with processes and methods that yield the finest construction limestone available anywhere in the world.